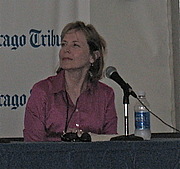 Photo by Lilithcat, taken at Printers Row Book Fair, 7 June 2008. Nancy Horan’s first novel, Loving Frank, chronicles a little-known chapter in the life of American architect Frank Lloyd Wright. It was translated into sixteen languages, remained on the New York Times bestseller list for more than a year, and in 2009 was awarded the James Fenimore Cooper Prize for Best Historical Fiction, presented by the Society of American Historians. Under the Wide and Starry Sky explores the shared journey of Robert Louis Stevenson and his spirited American wife, Fanny, in a sweeping adventure that unfolds over eighteen years and three continents. Nancy Horan has two sons, and lives with her husband on an island in Puget Sound.From the Hardcover edition. Displaying results 1-3 of 3 titles for "Nancy Horan"
Under the Wide and Starry Sky chronicles the unconventional love affair of Scottish literary giant Robert Louis Stevenson and American divorcee Fanny Van de Grift Osbourne. They meet in rural France in 1875, when Fanny, having run away from her philandering husband back in California, takes refuge there with her children. Stevenson too is escaping from his life, running from family pressure to become a lawyer. And so begins a turbulent love affair that will last two decades and span the world. The bestselling author of Loving Frank talks about her second novel, an improbable love story of Scottish writer Robert Louis Stevenson and his tempestuous American wife, Fanny. Nancy Horan's book Under the Wide and Starry Sky was available from LibraryThing Early Reviewers. Nancy Horan is currently considered a "single author." If one or more works are by a distinct, homonymous authors, go ahead and split the author. Nancy Horan is composed of 3 names. You can examine and separate out names.